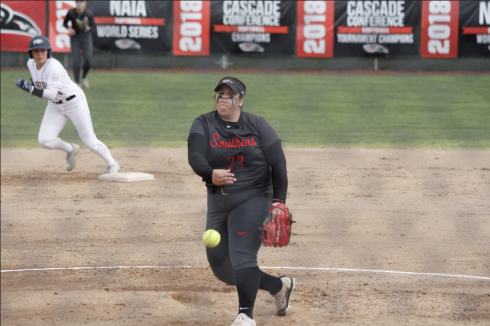 The Southern Oregon University softball team managed a key Cascade Conference sweep against College of Idaho Saturday at University Field, in Ashland, Ore. The Raiders won the opener 8-2, and then with benefit of five errors and rainy conditions achieved an 11-3 victory via the eight run rule in the afternoon game. College of Idaho started out the first scoring on a sacrifice fly to lead 1-0, then silenced SOU’s bats until the fourth when some power decided to come out. Freshman Melissa “Baby” Corn smashed a 2 out homerun over the wall to deep centerfield that blasted the crowd to life and sent a jolt thru the dugout. The visitors scored to cut it lead to 3-2, before sophomore Rayna Okimoto’s solo homerun over the wall in center pushed the score to 4-2. To complete the game one scoring Katie Moy doubled home Sarah Wharton, before Okimoto’s smoking hot bat launched a rocket over the wall in left final score 8-2. Jordyn Kurtz, pitched a tent in the circle and made it her home, while working the Coyote bat into a frenzy allowing the opposing offense only 2 runs, on 5 hits and 3 batters struck out. Game 2 started slow, as if the team ate to much Salvioli’s Concessions during the break, with no one scoring into the 3rd inning when Emily Matekel made it to 3rd base on a beautiful hit, an CoI error and a sacrifice fly scored her to make it 1-0. The Raiders take advantage of two errors, Okimoto and Barrantes had a single and double and the team had a 5-0 lead as a little rain started to flow from the sky. Following a Coyote rally in the top of the 6th that netted the team 3 runs, the Raiders softball team jumped on the rally train to end the game via the 8 run rule 11-3. During the rally Corn, Matekel, Karlie Stephens, Moy and Julia Willison all had a base hits, before Okimoto ended the game with a three-run double clearing the loaded bases. Jessica Flores and Stephens took control of the circle combining to hold the Lady Yotes to 7 hits, with 3 strike outs over 6 innings. 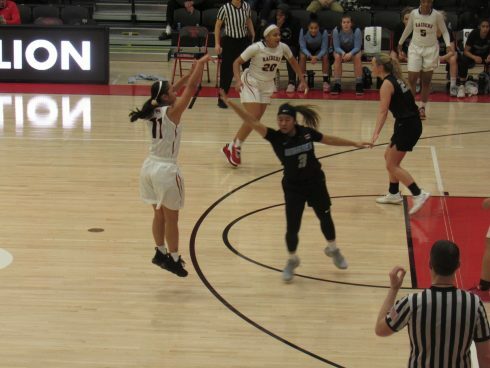 The victory moved SOU to 14-15 overall and 11-7 in conference play and right in the middle of the league playoff race.